This paper studies an infinite-server queue in a semi-Markov environment: the queue's input rate is modulated by a semi-Markovian background process, and the service times are assumed to be exponentially distributed. The primary objective of this paper is to propose approximations for the queue-length distribution, based on time-scaling arguments. The analysis starts with an explicit analysis of the cases in which the transition times of the modulating semi-Markov process are either all deterministic or all exponential. We use these results to obtain approximations under time-scalings; there we consider subsequently a quasi-stationary regime (in which time is slowed down) and fluid-scaling regime (in which time is sped up) are examined. Notably, in the latter regime, the limiting distribution of the number of customers present is Poisson, irrespective of the distribution of the transition times. The accuracy of the resulting approximations is illustrated by several numerical experiments, that moreover give an indication of the speed of convergence in the both regimes, for various distributions of the transition times. The last section derives conditions under which the distribution of the number of customers present is Poisson (in the exact sense, i.e., not in a limiting regime). Hellings, A.P, Mandjes, M.R.H, & Blom, J.G. (2011). 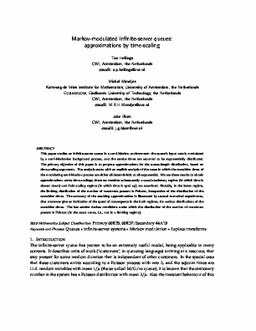 Markov-modulated infinite-server queues: approximations by time-scaling. CWI. Department of Modelling, Analysis and Computing [MAC]. CWI.